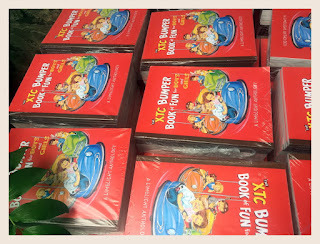 Il volume è pronto e in via prioritaria è già nelle mani di qualche generoso sostenitore che ne ha favorito la realizzazione (diventando all'istante un onorario Mayor of Simpleton): The XTC Bumper Book of Fun for Boys and Girls è oggetto di attenzione ufficiale anche da parte di Mark Radcliffe e Stuart Maconie, che ne parlano direttamente con Andy Partridge e Mark Fisher per BBC Radio 6 Music. 6 Music audio chefs Mark Radcliffe and Stuart Maconie rustling up a musical feast for your ears. Joining them in their radio kitchen today is Andy Partridge of post-punk band XTC and Mark Fisher, editor of 1980s cult XTC fanzine Limelight. Famous for their hits Dear God, Generals and Majors and Making Plans for Nigel, they're both here to talk about the fanzine, which was created for and by fans of the Swindon-based band, and claims fans such as comedians Stewart Lee and Phill Jupitus, Game of Thrones' Kevin Eldon and 'Suffragette' actor Joanna Neary.